For us who live in a Democratic society, we often think and feel that we have no point of reference for a feast like today that exults Christ as King. Many see kings as a hold-over from medieval society, a memory of tyrannical rule by those who have while, we, who don’t want a king, have not. Royalty are seen as figure heads that have now been replaced by some form of parliament. Others see kings as a way to oppress the masses – their motto and reasoning might go something like this: Absolute power absolutely corrupts. Thus, we have banished kings out of our vocabulary because we have no need of them. However, I wholeheartedly disagree. 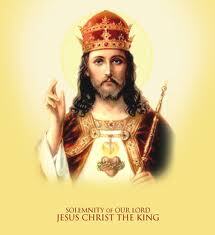 We may say that we don’t want or need a king but if that were true, why is it so prevalent in our American culture? A few years ago Hollywood gave us the Lord of the Rings trilogy and Troy. We’ve seen Alexander the Great running rough shod across the silver screen at the local multiplex. Last year, we saw Clash of the Titans, Princess Kaiulani and even Mega Mind wanting to rule their world. We have Burger King, and Budweiser – the king of beers . 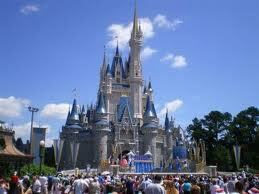 . . We have the Lion King (original and the 2011 remake) and Elvis – the king of rock and roll. I think at the end of the day we are okay with, and even desire Kings…as long as we are the ones wearing the crown. 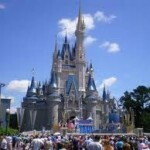 Have you ever gone to the Magic Kingdom where you could be a princess or prince for a day? But we all know that deep down, something is amiss. We work so hard to be in charge and yet, feel so empty when we arrive at the top. And that is because, we were never meant to rule: our happiness is found in serving the King of Kings and His people. But it is not just an external service assisting our neighbor. It is a service of the heart, a transformation of spirit that can only happen when we allow the rightful King to rule our hearts and minds and bodies. There is a simple maxim and truth: whoever creates something, best knows its purpose and place in this life. Meaning, the Blessed Trinity created us and, therefore, knows best what will make us joyful in this life and the next. our King, desires us to rule with Him by perfecting His creation and serving each other with all our hearts, minds, souls and strength. In a minute, we will have the opportunity to invite Christ the King to rule in our hearts, lives and homes. The Bishop has encouraged us to recommit ourselves and our families to the Sacred Heart of Jesus. 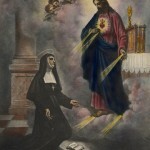 This image and devotion has been given to us by the 17th century Visitation nun, St. Margaret Mary Alocoque. 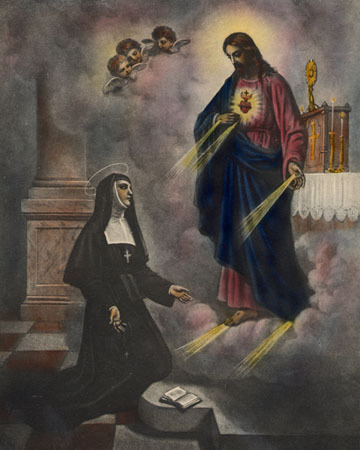 Our Lord appeared to her revealing His heart so we might know that our King is gentle, merciful, forgiving and aflame with divine love for us. The Bishop, in fact, is encouraging us to enthrone the image, which can be found in the bulletin, in a prominent place in our homes as a sign that he reigns in our hearts. How does our King rule? He freely hands over His heart to us so that we may be transformed by being bathed in His love. It is His rule in our lives and our submission to His law and kingdom of love that heals and makes us whole. Lord Jesus, gentle and humble of heart, we consecrate to You our persons and our lives. We give You our actions, our desires, our troubles, our joys and our sufferings. We give You our families, our friends, and our parish community. In the future we wish to live only to honor and love You and bring You glory. It will always be our heart’s desire to love You more and more, and to make You known, loved and served by others. We know this, O Sacred Heart of Jesus! You are the faithful friend, the heart’s intimate friend. You never abandon us. We trust ourselves to You! Above all, give us charity. Bind our hearts together in our parish community of [Insert parish name]. May our names one day be written forever in the Book of the Living with tjust who reign with You in the life of everlasting hahe ppiness. Amen. Jesus, gentle and humble of heart, make our hearts like unto Yours. I need this “reminder” that “we” win. Christ is the victor.